There is a dance ritual from the state of Terengganu, on the east coast of Malaysia, called Ulek Mayang. This dance is accompanied by one of the most haunting songs I've ever heard, also called Ulek Mayang. I first heard it as a teenager and I made up my mind to unravel the mystery behind the song - unfortunately, I'm still not quite there yet. There is no doubt that both the dance and song are offerings to the spirits of the sea. In Trengganu, these guardians of the sea take the form of seven beautiful princesses. A group of fishermen who were out at sea were caught in a storm. One of them, a young man, was swept overboard by a huge wave. The man finds himself being dragged deeper into the sea. While he fights for his life, he hears a haunting song and two lovely maidens appear before him. They charm him with their beauty and their song and pull him deeper into the water. However, the other fishermen managed to pull the young man out of the sea and drag him to shore. They try their best to revive him, to no avail. They look for a pawang (shaman) for help. The pawang told them that although the young man is alive, his spirit is still lost. The pawang burns some incense and asks the other men to bring offerings such as mayang (long sheaves of areca flowers) and rice coloured with turmeric. instead of coconut leaves in this re-enactment. The pawang began his incantations, when he became aware of another presence. He was shocked when two beautiful young women appear near the young man. The pawang realised that they were two of the seven legendary princesses of the sea. A battle of will ensued between the pawang and the two princesses. When the two princesses realised that they were about to lose, they summoned two more of their sisters. The epic battle of will continued, and finally the four sisters summoned two more sisters. The pawang felt his hold on the young man's spirit slipping away, when the seventh princess emerged. She is the eldest and the most powerful of the seven princesses. The seventh princess proclaimed that she knew the origins of everyone present (when vanquishing demons/spirits it is always necessary to know their true name and origin) and that those who belong to the sea must return to the sea and those who belong to land must return to the land. The six princesses have no choice but to yield to their eldest sister, they relinquish their hold on the young man. Then all seven princesses walk into the sea and vanish. The young man regained consciousness with no knowledge of what had just transpired. However, he remembered a dream where six beautiful princesses enchanted him. The pawang and the young man gave offerings to the seven princesses of the sea. These consisted of bowls of coloured rice and flowers. 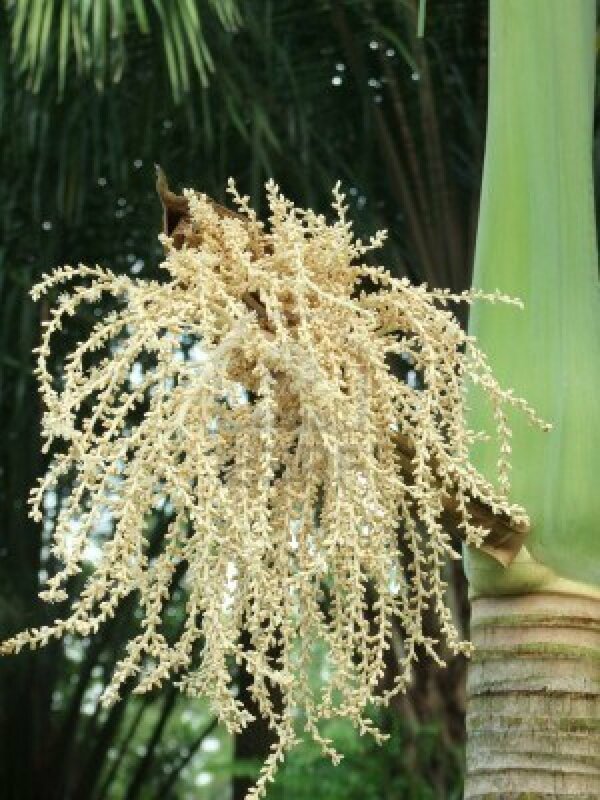 The name of the song Ulek Mayang refers to the inflorescence of the Areca catechu. Mayang is the long sheaves of flowers, while ulek means entreat. The song entreats/summons the spirit of the flowers or perhaps uses the flowers to appease the spirits of the seven princesses i.e. pleading with them not to take the lives of fishermen and those who are at sea. If you are wondering how the inflorescence of a plant could have so much power, consider the Welsh legend of Bloduewedd (refer to my post, Adapting Asian Folktales for Children's and YA Literature /2013/05/adapting-asian-folktales-for-childrens.html ), a woman created from the essence of the flowers of oak, broom and meadowsweet by a powerful sorcerer called Gwydion. 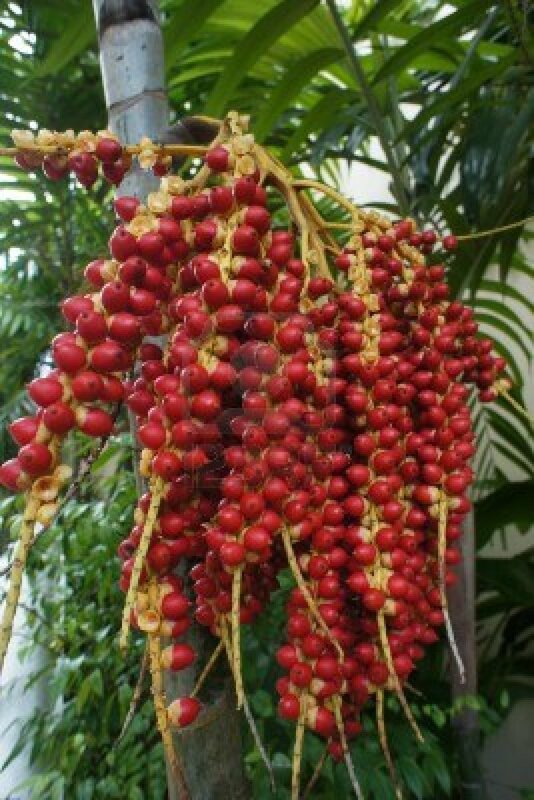 Incidently, the term mayang mengurai also refers to a woman's unusually long luxuriant hair which resembles Areca catechu inflorescence. Mayang could also refer to the inflorescence of the coconut flower, although coconuts have less ritual significance than the areca nut. The song also describes the seven princesses - all seven are dressed in exactly the same way. They are dressed in a garment which is askew; their hair is knotted on the side; they are adorned with ivory ear-rings and each carry a yellow selendang (a long scarf). Bunches of ripe areca nuts hang froma palm tree. which turn bright red when ripened. However it is the nut inside which is of value. bunga in Filipino and supari in Bengali and Marathi. betel leaves and a string of jasmine buds. 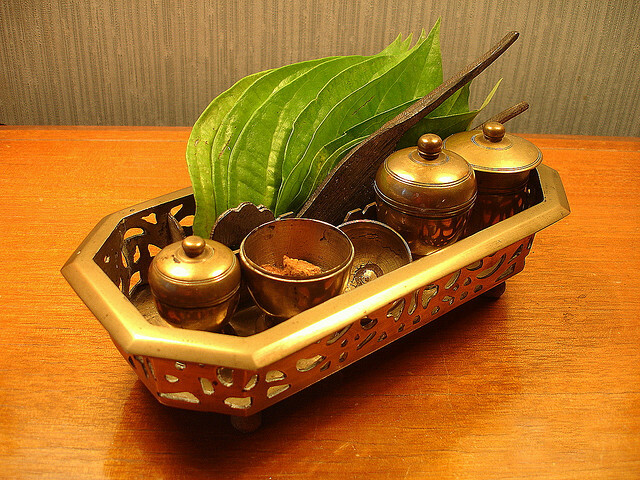 Not surprisingly, betel leaves and areca nuts play an integral role in traditional Malay marriages. 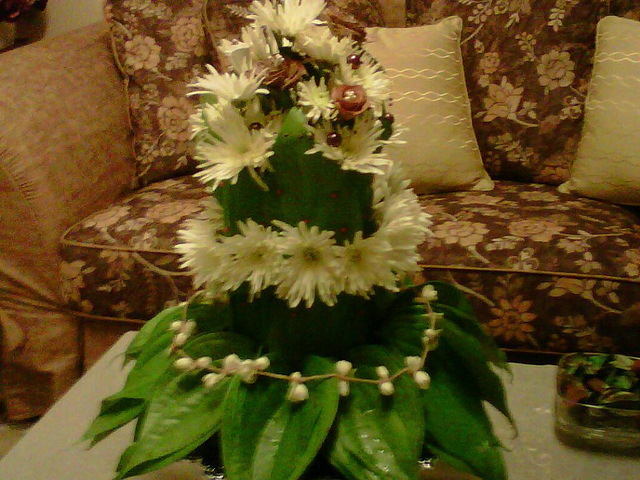 The hantaran (bridal gifts) of five, seven or nine items, must include a floral arrangement incorporating betel leaves. The other compulsory items are a wedding ring and a set of traditional clothes. In the past, an expensive betel box (tapak sirih) was also one of the hantaran, especially for members of the bangsawan (nobility) and for royalty. 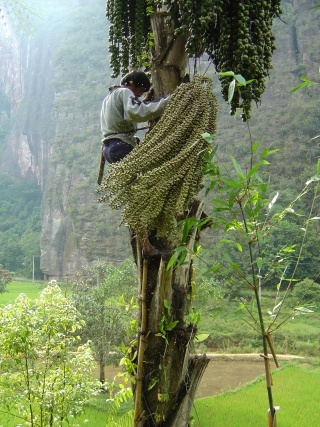 However, as betel chewing is no longer popular (in fact, it is frowned upon), the betel box is no longer produced.